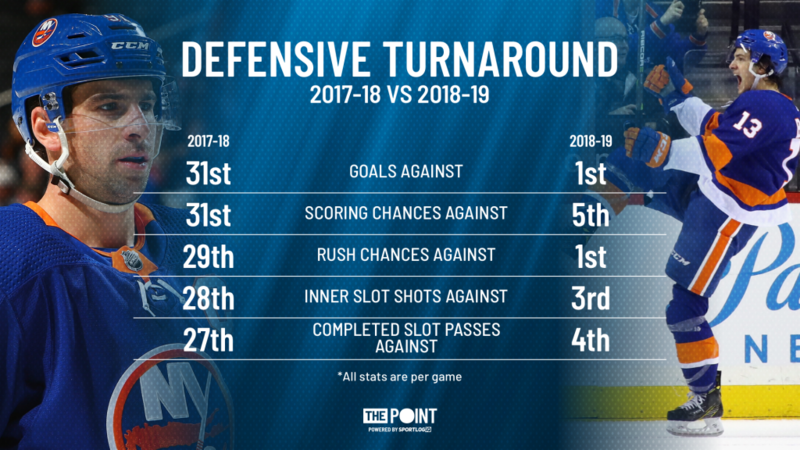 How the Islanders Defense Went From Worst to First in One Year - The Point Data-driven hockey storytelling that gets right to the point. We were wrong about the Islanders. Dead wrong. In our season preview, we predicted the Islanders would finish last in both the Metropolitan Division and the Eastern Conference. It made sense at the time. Yes, they did have a new, Cup-winning head coach in Barry Trotz, but this is a team that missed the playoffs and allowed the most goals in the league before losing its franchise player. Instead of falling down the standings, the Islanders now have the league’s best defense and sit on top of their division – second to only the Lightning in the East. Trotz has turned his team into a defensive juggernaut in a year where scoring is up across the league, as we wrote about here. That is a massive turnaround, especially since the team didn’t add any defenseman of note to their roster. They did add some skilled defensive forwards in Valtteri Filppula and Leo Komarov, but they’re not the kind of players who transform your team by their presence alone. Robin Lehner, another new addition, and Thomas Greiss have split starts and have been outstanding in net, taking full advantage of a stingy defense in front of them. 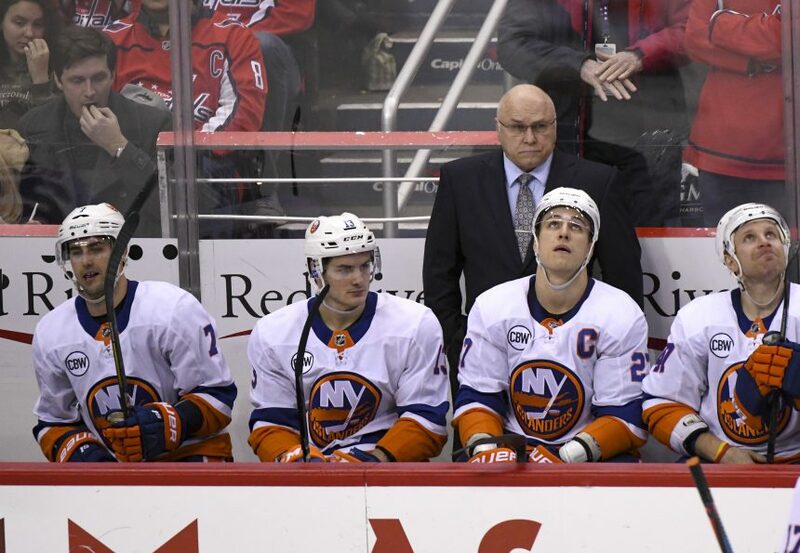 The Islanders’ are top 5 in terms of team defense and the goaltending is top 3. Put it together and it’s a recipe for the top defensive team in the league. 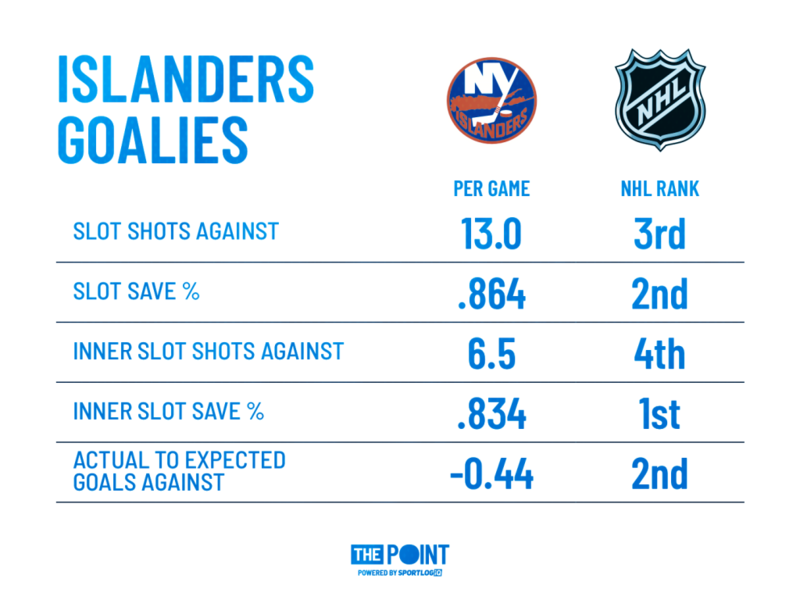 The Isles are facing some of the lowest high-danger shot totals in the NHL this season and the goalies have been stellar on the few looks they do face. They’re saving their team about one goal every two games, relative to league average, based on shot quantity and quality. Only metahuman John Gibson and his seldom-used backups have posted a better mark than the Islanders’ tandem. One area in particular where the Islanders have been massively better is the way they defend the rush and limit entries against. 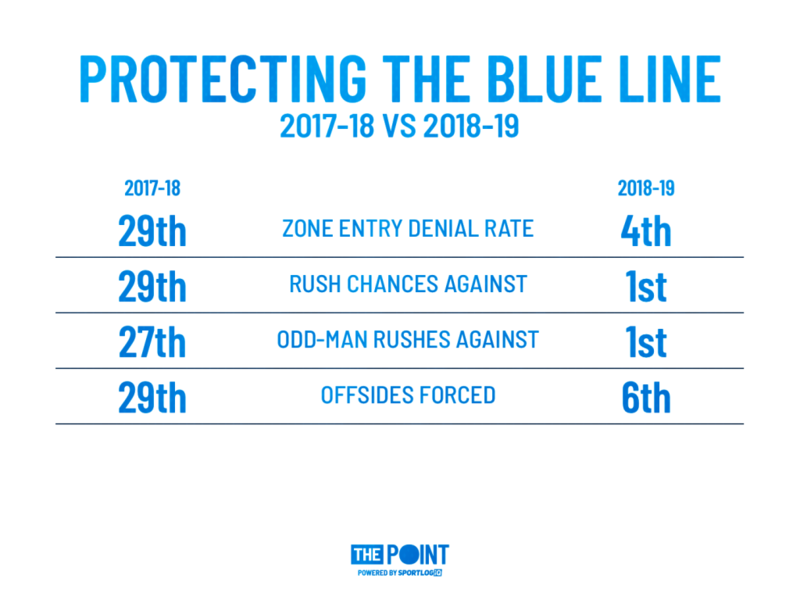 In the span of a year, their blueline has turned from a strainer to a brick wall. They allow nearly half as many odd-man rushes as they did a season ago (6.1/game to 3.8/game). Instead of being caught out of position, they now force opponents to make mistakes at the blueline, killing their momentum. Even when the opposition does manage to get into the zone, the Islanders are covering the middle of the ice extremely well, allowing the fewest rush scoring chances, making life a lot easier on Lehner and Greiss. Combine stout defense, stellar goaltending, and great blueline protection and you get the league’s best defensive team this season. They’re on pace to allow 244 goals this season, nearly 50 fewer than last year. With three goals against in their last five games, including a pair of shutouts, that number could be even lower come April. That’s the kind of team no one wants to face in the playoffs.